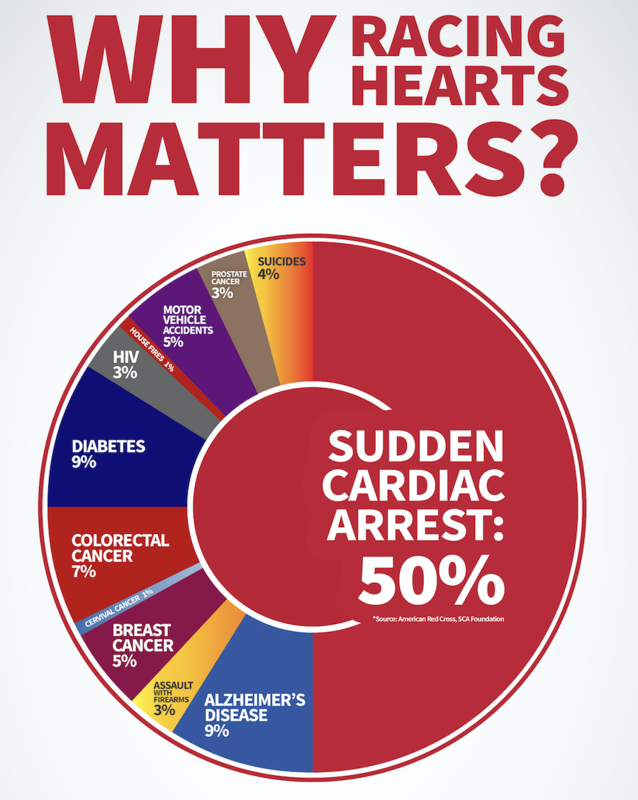 Sudden Cardiac Arrest | Racing Hearts - Helping to save lives with AEDs. Too often, we hear about stories in the news—a student is at sports practice or game and suddenly he or she collapses from a sudden cardiac arrest. When an unexpected tragedy like this happens, immediate use of an automatic external defibrillator (AED) gives victims the greatest chance at survival. However, often an AED is not available. Current success rates, which have remained unchanged since the 1960s, are at 5%. BUT we can increase our success rates up to 80% with life saving heart defibrillators at all high risk locations in our communities. Data/Chart: SCA-Aware.org online (with data from CDC.gov) & Staying Alive Paramedical Services online 2011.